Prof. Francis Ezeonu, the Resident Electoral Commissioner (REC) in Imo, gave the advice at a one-day town hall meeting/sensitisation visit by Imo REC and his team to Nwangele Local Government area of Imo. Ezeonu said that the importance of a clean, violence-free and hate speech-free electoral campaign could not be overemphasised. He said that although the time for campaigns and elections were still in view, there was the need to sensitise the Imo electorate on proper behaviour ahead of the election. The Imo REC said that election should not be a do or die affair and emphasied the need for election winners to lay aside party affiliation and embrace all other contestants for progress and development. He assured of adequate training and retraining of INEC and other adhoc staff on proper conduct, handling of machines and other sensitive materials during and after elections. Ezeonu called on the people of Nwangele to go out enmass and register in the ongoing voter registration exercise, stressing that politics is a game of numbers. Earlier in his welcome address, the Electoral Officer in Nwangele, Mr Daniel Lifu, had expressed gratitude to the REC for the visit and awareness creation exercise. He said that the number of registered voters had increased tremendously since the beginning of the year, especially with the introduction of mobile registration. According to him, a total of 3,850 persons had registered in the area since the CVR exercise. He said that so far, only 49 PVCs had been collected from earlier registration exercises, while 4,346 were still pending. Some stakeholders commended INEC on the sensitisation programme which they described as a step in the right direction and a show of concern and love. They, however, blamed some staff of the commission for allegedly aiding rigging in elections and urged INEC to put its house in order. They also urged INEC to ensure proper training of its staff to avoid mistakes of the past. Mr Ugonna Ozuruigbo, the Imo Deputy Speaker, who hails from the area, expressed gratitude at the visit. He said that there had never been any successful rigging without the connivance of INEC officials of INEC. He thanked the REC for working towards turning a new leaf. She expressed optimism that the sensitisation exercise would go a long way in helping to bring positive changes to electoral processes. 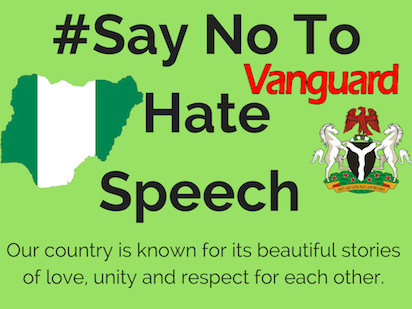 The post INEC warns against hate speeches during political campaigns appeared first on Vanguard News.